Paris Fashion Week: Yang Du. Today Yang Du, a London based Designer, showed her “Why do fools in love?” collection – including a choreographed performance at the On/Off space. 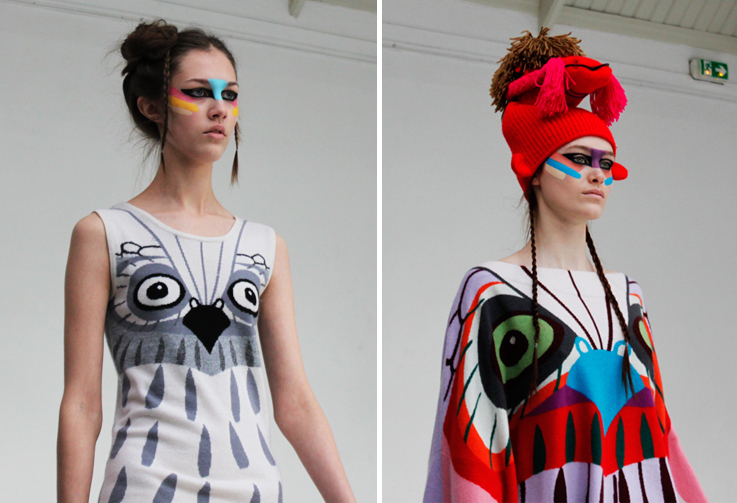 Her inspiration was Noah’s Ark and so she used owls, foxes, flamingos or elephants as print for cashmere dresses, hats and backpacks. And by the way, don’t you think that the make-up was perfect for the colorful collection, too? outfit: paris fashion week day two. Paris Fashion Week: Models at Balmain.